Dean Leslie White passed away January 22, 2019 at age 92. He was born in Topeka, Kansas to Ray P. and Thelma Day White. He was a Boy Scout and attained the rank of Life Scout. Dean graduated from Topeka High School where he participated in football and basketball. He started his first year at Washburn University where he studied economics. He enlisted and served in the Navy Medical Corps during World War II. Dean left the Navy and attended Washburn University for two years under the GI Bill of Rights where he also played basketball and football. He married Eloise Kelly in 1947 and had three children and was later divorced. He was married to Frances Gunnerson in 1959. Dean was associated with his father in construction, then on his own, and later with his son, Jim White. 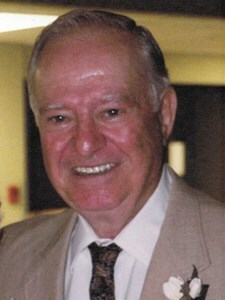 Dean was a Board member of Southwest State Bank, a member of First Congregational Church, and Western Hills Golf Club. He retired from construction in l985 and managed property for Lou and Bert Falley. Dean was preceded in death by his wife Frances and son, Jim. He is survived by daughters Vickie Mills (Don) of Colorado Springs, CO.; Susan Buchanan of Los Altos, CA. and a step-daughter Marilyn Huncker (Rich) of Topeka. Dean had seven grandchildren and 12 great-grandchildren. Funeral services will be held at 1:00 pm on Saturday, January 26, 2019 at Mount Hope Cemetery & Funeral Chapel. Entombment will follow in the Mount Hope Mausoleum. A reception will follow the service at the Mount Hope Funeral Chapel. Memorial contributions may be made to the Topeka Rescue Mission. Add your memories to the guest book of Dean White. Uncle Dean was my favorite Uncle. He rented me my first apartment in Topeka and I worked for him at the country club. When we got married, he was always there for us. Plus he happily took my money when we played cards (luckily not to much). He always had a smile for us and had that great contagious laugh. I know how much my Mom and Dad enjoyed traveling and playing golf with Fran and Dean. He will be missed. Susan and Vicki, so sorry to hear of your father's passing. It is never easy to find words of solace at these times. My prayers and condolences are with you. Keep him in your hearts. Mr. White was a very nice man, as a young agent he was a familiar face at local events and always had a bright smile and friendly handshake. May he rest in peace after a long life well lived. I miss you terribly and all our many phone calls and your wise advice. Lauren and Andrew miss you too. You were a good father. Thank you for everything you did for me.